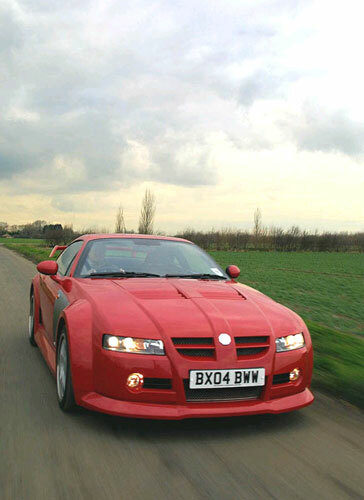 The MG SV was the pet project of the MG Rover senior management to create a halo model for the modern MG range. It was a complete departure from all previous model MGs with the only possible comparable model being the 1930’s K3 Magnette. The project was of questionable value to the company or MG sales and was priced between 65,000 and 85,000 UK pounds, and certainly diverted resources that could have been focussed on more profitable mainstream models. The discussion surrounding all aspects of this model will be sure to be a long term MG discussion point. The cars was a 2 seat closed coupe of considerable performance and technological content, developed from the Qvale Mangusta, which in turn was developed from the De Tomaso Bigua. De Tomaso being a well-known Italian carmaker who with models like the Pantera exploited the well proven route of smaller coach built and efficient European body powered by a big lazy American V8. Towards the end of the De Tomaso production period they developed the Bigua, which followed the same example using the Ford Mustang Cobra 32 valve, all alloy V8 engine and gearbox. It was not a success and the company was taken over by Qvale, well-known American car family with deep historical MG connections. They transformed the car into the rather ungainly styled Qvale Mangusta, which was also not a success. In 2002 MG Rover was the surprise buyer of the remaining assets and from this the far better looking MG SV, styled by the world renowned designed Peter Stevens. The SV is built on a lightweight steel chassis, which has integral roll over bar protection, built to FIA standards. The chassis is clothed in a very lightweight and advanced carbon fibre body that is made up from over 3000 separate pieces of carbon fibre material. This is made and cut to size in the UK before it is shipped to Italy where each part is laid in moulds before being ‘cooked’ to form the rigid sections that are then bonded or bolted together to form the complete body. The chassis, made in Italy, is fully built up before the body is attached, then the mechanically complete cars are finished in the UK. The engine remains the same 4.6 litre all alloy V8 engines with twin cams per bank and four valves per cylinder that delivers 320bhp in base SV format. However, 5.0 litre 380 bhp versions were fitted to the SVR. The gearbox was a 5 speed manual, with only a couple of automatic versions made. The collapse of MG Rover saw the early demise of MG Sport and Racing, the subsidiary of MG Rover responsible for the MG SV after only around 50 cars of all variants were made.